On Saturday, March 29, the Centennial and Northview Jazz Bands will host a swing dance in the Music Wing from 6:30-9:00 PM. Tickets are $5 for adults, $3 for students with a $20 maximum. Band students get in for free! Desserts and small snacks will be provided. Larry & Rae Mullica will provide a learning session at the beginning of the evening to show all how to swing dance. 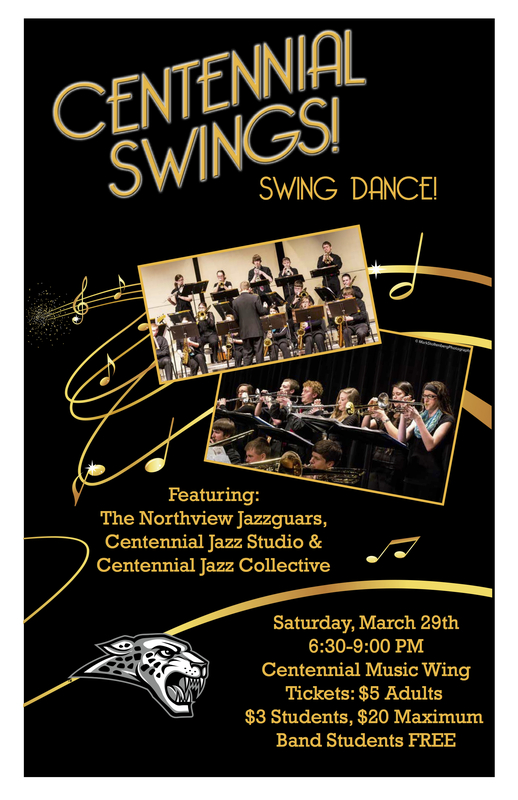 Centennial Jazz Collective, Centennial Jazz Studio, and the Northview Jazzguars will be providing swing dance music as well as music from their competition and performance sets from throughout the year. Spread the word! The jazz bands are using this performance opportunity as a way to raise funds to travel to out-of-state competitions in future years. Questions can be directed to Burton Hable at Centennial High School. Big thanks to Mark Stoltenberg Photography and Carin Murphy for the photos and posters!